Jewelers need to make molds of objects and parts frequently. Usually wax is poured into the molds and the results used for casting. There are all sorts of vulcanized rubber molds, silicone molds and others which are intended for specific problems, in fact there are dozens of them. This article touches on a couple of methods for when you really need to make a mold and don’t have the right molding materials on hand. In the old days, before easy rubber molds, a goldsmith would record their work for posterity when it left the shop by making an inch thick slab of clay or plasticine, then pressing the unset piece of jewelry into the clay. There would be three views pressed in, top, side and front view (just like an orthographic projection drawing). Thus a ring would have its front, side and top with settings pressed in. A quick wall of clay or paper would be made around the clay slab with its impressions. Then plaster of paris would be poured into the walls, and when the plaster hardened there would be the three views of the ring in positive relief, and the jewelry could be duplicated later by referring to the plaster model. Usually they would be painted with lacquer to harden the surface and make them last, and you can find examples that have inventory numbers carefully lettered on, so it is clear that this is how designs were organized. Rather than making a positive a mold can be made from an object (the mold is now a negative), and wax poured into it for casting. Plasters are excellent for this. Jewelers have forgotten how useful plasters can be for certain problems, especially low relief duplicating. My favorite serious molding plaster is Vel-Mix, the material used at the dentist to make very hard (usually pink) models of your teeth and gums. Vel-mix works like any plaster, but is extremely hard, strong, durable, and is very fine grained so its surface reproduction is perfect. The molds are so hard they resist breakage and damage. This is a way that medallions are made. First you make a plasticine model of the low relief image medallion (with no undercuts), then you make a wall around it with clay, wax or paper, and pour Vel-mix in. Let it set, remove the model. Before using it soak it in water for ten minutes or so which prevents wax sticking to it. Wax (injection wax is best) is melted and smoothly poured into the impression, a piece of sheet metal is used to squeegee excess wax off and the resulting wax model shrinks slightly and is easily removed from the Vel-mix mold. The wax can also be poured or blown out to produce 1-2mm thick shells rather than a thick wax model for casting. The mold holds up pretty permanently. There is a great soldering investment called Kerr Quickset #2 (investment stone) which is used for rapid soldering jigs. You mix it like a plaster and it sets in 30 seconds, holding parts together while soldering. The material is very hard, and makes an excellent, speedy version of a short run plaster mold. At the hardware store there are a number of materials, like Spackle, wall filling compounds and so on that will work as well – check our your building materials aisle. 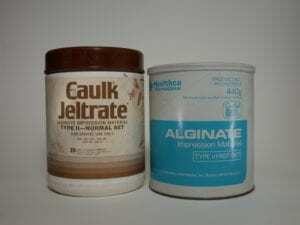 Easiest to use and very cheap are alginate mold compounds. They are used in dentistry. When the dentist puts that tray in your mouth with the goopy material that sets up in a minute, that is alginate. It is quite cheap for a large can of it and has excellent detail. And it sets up really fast. It is also non-toxic – it is after all intended to go in your mouth. You mix it, pour it or spatulate it onto the object to be molded, it sets quickly. Remove it from the object and pour molten (injection) wax into it, and as soon as the wax sets take it out, and pour the next one. 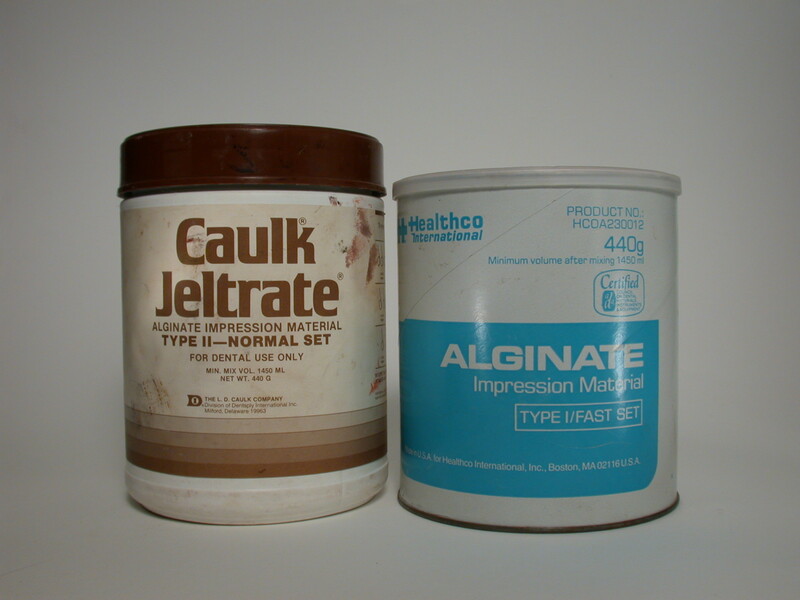 You will get between 6 and 15 waxes from an alginate mold before it breaks down. It can be stored in water to keep a mold for a week or so. As well, if you let a mold dry out it shrinks about 40%, and then if you wet it you can get a reduced size wax out of it, which can be interesting. Dental, jewelry and sculpture suppliers will carry it. It is essentially the same thing as agar-agar, a gelling agent used in Chinese almond deserts and in other food gels. There is in fact a whole world of kitchen ingredient molding materials, using flours, salt, cornstarch and more. See the sidebar for information on these. Silicone caulking is cheap and can make very good molds. Sculptors use is as a cost effective approach to large mold surface areas. Glass workers and sculptors will knead silicone caulking underwater with some soap or detergent until it forms a bulkier material which they use for molds. There are lots of descriptions of this on the internet.